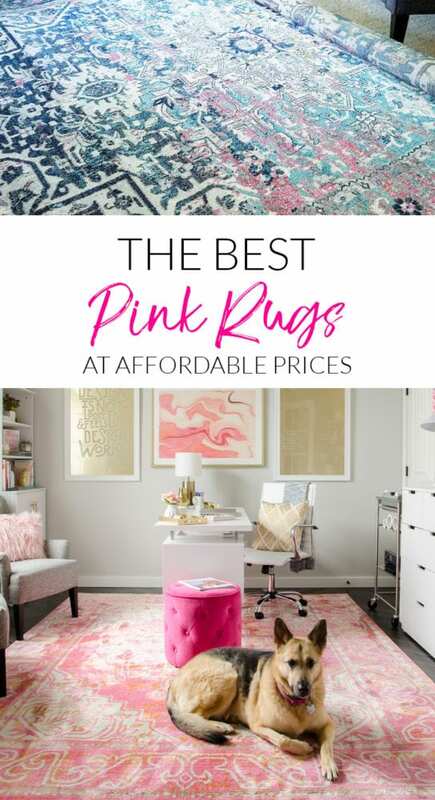 I was terrified when I clicked the purchase button to order the pink rug for my office. It seemed nutso to order a large rug, site-unseen, in pink. The risk was totally worth it, and that rug gets more positive comments and questions than any other item in the house. The rug is soft and has some stands of gold that make it extra gorgeous in person. It’s not crazy thick, but is really solid for the price point. It’s held up really well to Maddie’s claws and hair. Sometimes it hides the hair a little too well, but I’d rather have that than the opposite since the office is right by the front door. The only downside is that now I want a pink rug in every room of the house. In fact, after looking at approximately 9 zillion rug options for our living room, I ended up with one with subtle pink accents! I was worried a rug with pink in it wouldn’t be versatile, or that it would be too feminine. Thankfully, both concerns were unfounded. 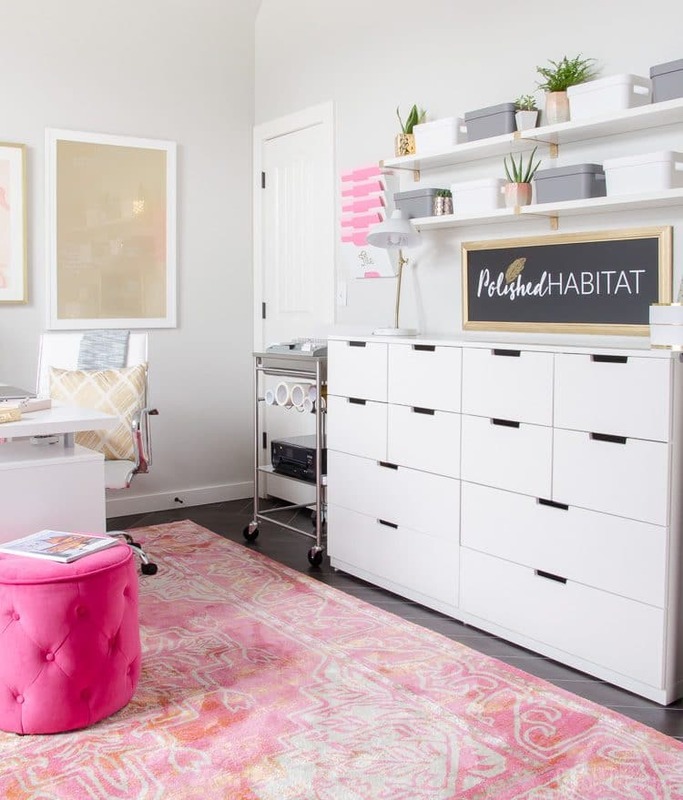 While the office is definitely girly with layers of pink, the living room has a more neutral to masculine feel, even with the areas of pink in the rug. The colors are blended enough that it still looks great with the fall decor. I love that the colors look really rich and saturated in the evening, but when the sun is shining, it’s lighter and brighter. Here’s a closer look from my Instagram feed. Isn’t she a beauty? The living room rug is newer, but is also a winner with dogs. I LOVED the look of the one we had before this in the living room, but it wasn’t pet-friendly. Every single day there was a new snag. On a happier note, we also added a modern abstract rug with highlights of pink in the entry. We originally bought it for the dining room, but it wasn’t working quite right there. I’m SO glad we ordered it because it turned to be PERFECT in the entry, adding a bit of modern flare that was missing from the space. 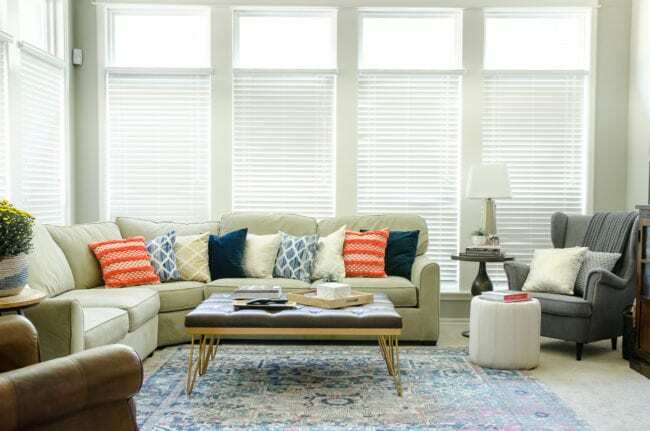 Since I bookmarked tons of rug options while I was researching both the office and the living room, I thought it would be fun to share them all in case anyone else was on the hunt. I tried to stick with options that were affordable, or at least not super-expensive for their size. Some of them are even downright cheap! I separated the rugs into three different color groups. Flip through them using the left/right arrows on each section. Want a softer look, perfect for a nursery or calm bedroom? Try these! 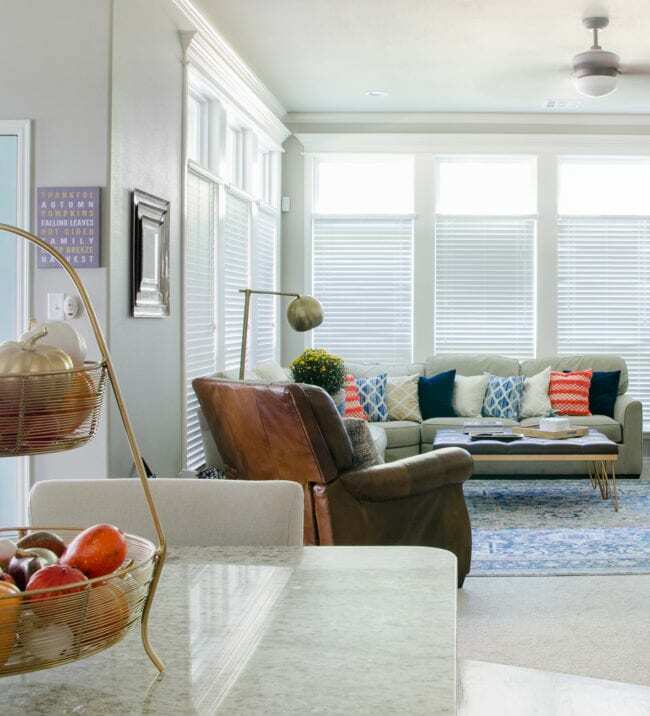 From traditional to modern, these rugs bring bold style. Try them in an entry, kitchen, or living room. Not ready to commit to a full pink rug? 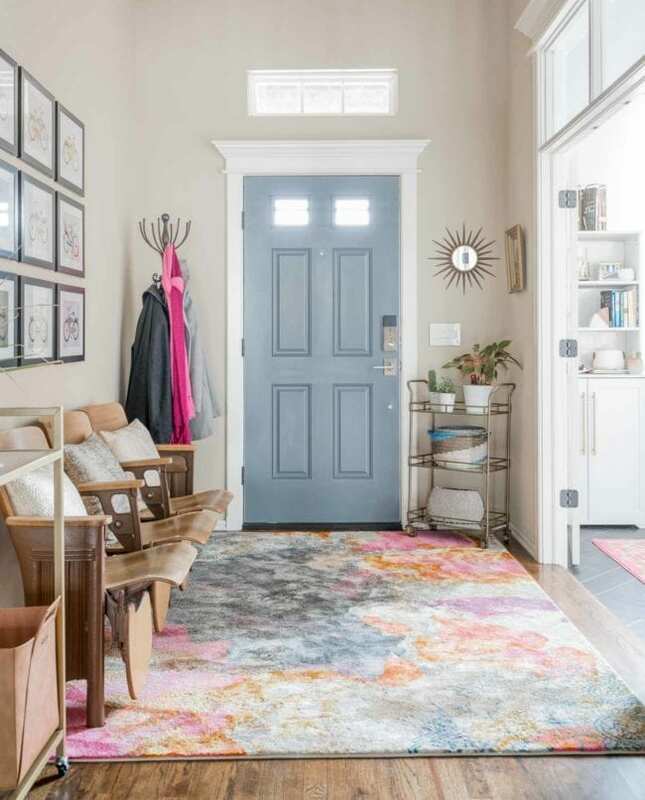 Try these multi-color rugs that have a least of pop of pink. They are 100% versatile and could work great anywhere. We love ours in the living room, but they’d be pretty under a dining table as well. PS: If you love pink, you should visit the first place I ever added pops of it next. 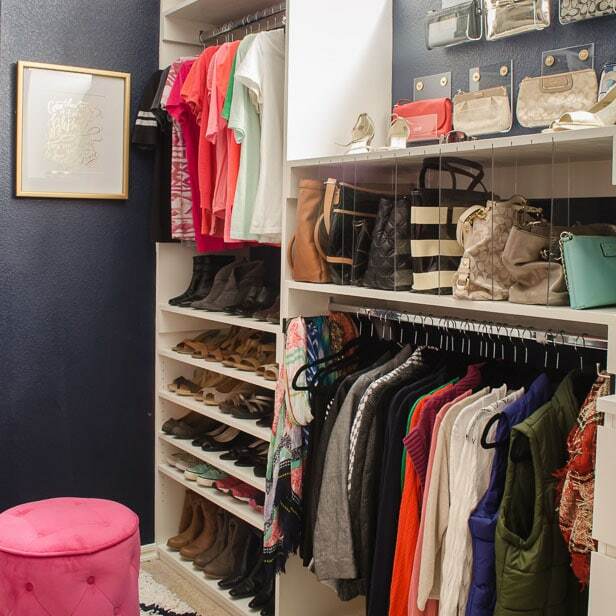 See our closet transformation here! I loved the pink rug in your office. I am redoing my office. Under your Pink Rugs, the first rug you showed I fell in love with. Could not find where you ordered it or the name of it. If you have a couple second, please send it to me. Hi Beth – they should have been clickable, but I can definitely find the link if it wasn’t working! The first one under soft pink is: http://rstyle.me/iC-n/chrb3db5wxf_ The first one under bold pink is: http://rstyle.me/iC-n/chraxab5wxf_ and the first under hint of pink is http://rstyle.me/iC-n/csuwdub5wxf_ . If none of those are the one you’re talking about, just describe it and I’ll track it down. 🙂 Happy shopping! Thanks, Melissa! I got it now! Hi there! Where did you get the white credenza with all the drawers? I need that!